The Digambar Jain Siddha Kshetra Rajgir is a very ancient and holy place of pilgrimage for the Jains and it is 97 kms from Patna. It is located in a beautiful valley with lush green forests. It is dedicated to Lord Munisuvratnath the 20th Tirthankar and is considered very sacred as the Garbha, Janma, Tapa and Jnan of Lord Munisuvratnath took place here. As it has been constructed on five hills this holy place is also known as Panch Pahadi. Rajgriha or Rajgir has a very important place in history as it was the capital of the ancient kingdom of Magadha. Along with Jainism this place is also closely associated with Buddhism. Lord Mahavir is said to have spent a long time here and performed twelve Chaturmas here preaching and spreading divine wisdom. Chaturmas is the holy period of four months generally in the rainy season when monks and ascetics cannot move from place to place. This period is used for fasting, penances, austerities preaching or listening to religious discourses etc. Nearly one fourth of the monks devoted to Lord Mahavir belonged to Rajgriha district thus his influence on this ancient city was great. There are ten temples located on the hills and two are located in the valley. The first hill known as Vipulachala has four beautiful temples located on it. A huge monument has been built here in memory of Lord Munisuvrathnath. On the second hill Udaigiri there are two temples which were said to be discovered when the place was being dug up. Idols were recovered from here and have been installed in Lal Mandir situated in the valley. On the third hill Ratnagiri there are some Jain temples. On the fourth hill known as Swarnagiri or Shramangiri there are three temples. On the southern part of this hill there are two caves and images of the Tirthankars have been carved on the walls of these caves. 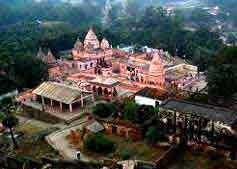 On the fifth hill known as Vaibhavgiri there are five temples. There is a Shalibhadra temple besides the Jain temple. A 1200 year old Jain temple has been recovered here after digging 24 rooms and many ancient artistic idols are installed here. A short distance from the last hill foot images of Ganadhar Bhagavan the close disciple of Lord Mahavir can be found. The ruins of the palaces of King Bimbisara of Magadha(Known as King Shrenik in Jain texts) can also be seen. Road – Buses and Taxis are available from Patna, Gaya, Nalanda, Bihar Sharif. Rail – Rajgir is the last station on Babhtyarpur – Rajgir line which is 1 km from the temple. There is a Dharmashala here which can accommodate 1000 people. Rajgriha was a great centre for Jainism and ruins of caves, monasteries, shrines etc can be seen at many places. The ancient Jain texts also mention Rajgriha as a place of great importance to the Jains. The beautiful scenic hills and the peace and solitude makes it an ideal place for pilgrims to soak in the sacred vibrations of the Tirthankars who hallowed the place with their purity and Divinity which help the pilgrims in their onward quest for enlightenment and bliss.